Dundrennan is a quiet Scottish village in a valley near the sea. Like other villages in the area, it is located on the heritage coastline of the Solway Firth, an area of unspoiled hills, cliffs, islands, bays and beaches – the Scottish Riviera. However, unlike them, Dundrennan itself has an extraordinary history. The ruins of the Abbey lie adjacent to the village. Dundrennan Abbey, dating from 1142, was the first of three Cistercian abbeys along the Scottish coast and was founded by Fergus. Lord of Galloway. The remains of the transept and chancel of the abbey church still stand by the Abbey Burn. The monks of Dundrennan went on to found two other abbeys, Glenluce to the west c 1190, and Sweetheart to the east in 1273. While Whithorn, further to the west was the earliest Christian settlement in Scotland, Dundrennan was the heart of mediaeval pre-reformation life. 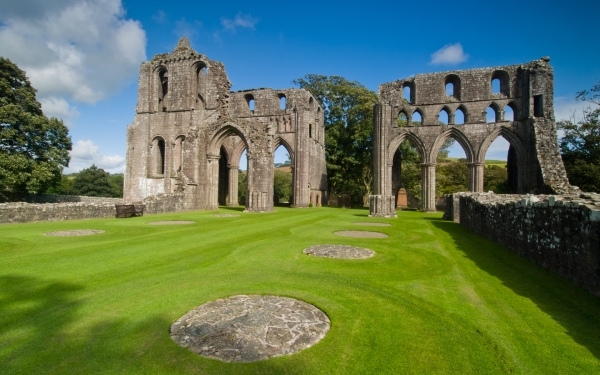 After the reformation, instigated by Henry VIII, the Abbey was dissolved along with the great abbeys of England, after having been active for 400 years. Galloway is often passed by – but that is the essence of its charm. It enjoys a mild climate due to its coastal position. Galloway offers the same mountains, castles and coastline as the Highlands and Islands, but with many fewer visitors and less pressure on amenities. Kirkcudbright, our adjacent burgh, is a charming artists’ town and active fishing port. The wider area has a great deal to offer walkers and hillwalkers, cyclists, wildlife enthusiasts and those who just want to make sandcastles or explore a (reputedly active!) smuggler’s cave. The houses in the village postdate the Abbey, and much of the building stone for the older houses will have come from its buildings. The old road to the Abbey came along the coast, and descended the hill down to an old bridge over the Abbey Burn. This bridge is reputed to predate everything except the Abbey itself, although it may have been rebuilt a few times since the 12th century! The village is built around the junction of the new main road from Dalbeattie to Kirkcudbright with the old road from the bridge. There are about 40 houses in the village. Residents take pride in the village’s appearance and history. Dundrennan is predominantly a farming community with significant milk production from several modern farms. Craft and specialist businesses also operate nearby. We have a refurbished village hall where regular events take place and which is available for hire. The abbey‘s most famous visitor was Mary, Queen of Scots. On 16 May 1568, she boarded a boat at a bay, now called Port Mary, near Dundrennan. She was bound for the Cumberland coast. She never returned to her native land.